Different martial arts use different uniforms. Kung fu follows that pattern. While karate and jiu-jitsu both use a gi, though their collars are different, in kung fu we use different style uniform. Another difference with what we wear in kung fu compared to other martial arts is that instead of colored belts, we use sashes. In kung fu, the uniform is made in such a way as to not restrict body movement. A 2-piece set, not including the sash, is best at this. That means we wear pants and a shirt. As simple as this sounds, there is still an incredible amount of room available for customization. Depending on whether you want a uniform for training or for a competition, you may want to choose different materials. Also, your environment may play a role in what sleeve length you choose. And let’s be honest here, some uniforms just look much cooler than others, so style plays a role too. The kung fu shirt most commonly is available in two styles. There are long-sleeve tops and sleeveless tops. I have rarely seen anything that falls in between these two extremes, but that doesn’t mean the don’t exist. You can find short-sleeve options, but they aren’t nearly as common. One thing that differentiates kung fu shirts from karate gi shirts is that they usually have loop and knot style frog button fasteners. As far as kung fu pants go, they tend to match the style of short in color and material. Again, the main purpose to to allow unrestricted body movement. They tend to be lightweight and loose fitting. Something that makes kung fu pants different than a standard karate gi’s is that many of them have elastic around the ankle area. They also tend to match the style of the shirt. The uniform as a whole can be made of a variety of different fabrics. Two of the most popular fabrics are cotton and silk. As you can guess, cotton uniforms tend to be a little more durable than silk. The former is great for activities like training on a Wing Chun wooden dummy while the latter is great for catching eyes at competitions. You’ll also see a lot of custom designs out there made specifically for certain schools. No matter if you are looking for a uniform strictly for training or if you need one for a competition or performance, there are plenty to choose from. 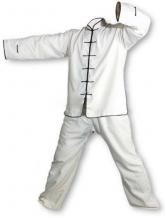 In my opinion, kung fu uniforms are some of the coolest and most unique uniforms in all of martial arts.